Turkey's landscape is made up of low, rolling hills, the fertile river valleys that open to the Aegean Sea, the warm plains along the Mediterranean Sea, the narrow coastal region along the Black Sea, and the rugged mountain ranges that surround and intersect the high, desert-like Anatolian plateau. Most of Turkey lies within an earthquake zone, and recurrent tremors are recorded. Turkish cuisine is often regarded as one of the greatest in the world. Its culinary traditions have successfully survived over 1,300 years for several reasons, including its favorable location and Mediterranean climate. The country's position between the Far East and the Mediterranean Sea helped the Turks gain complete control of major trade routes, and an ideal environment allowed plants and animals to flourish. Such advantages helped to develop and sustain a lasting and influential cuisine. often covered in a yogurt sauce. Manti has often been credited with first introducing dolma (stuffed foods) into the Turkish cuisine. The milk and various dairy products that became staple foods for the herdsmen were nearly unused by the Chinese. This difference helped the Turks to establish their own unique diet. A heavily influential Turkish cuisine was well established by the mid-1400s, the beginning of the (Turkish) Ottoman Empire's six hundred-year reign. Yogurt salads, fish in olive oil, and stuffed and wrapped vegetables became Turkish staples. The empire, eventually spanning from Austria to northern Africa, used its land and water routes to import exotic ingredients from all over the world. By the end of the 1500s, the Ottoman court housed over 1,400 live-in cooks and passed laws regulating the freshness of food. Since the fall of the empire in World War I (1914–1918) and the establishment of the Turkish Republic, foreign dishes such as French hollandaise sauce and Western fast food chains have made their way into the modern Turkish diet. 1 pound marscapone (sweet cheese); cream cheese softened with a little sour cream, heavy cream, or even milk may be substituted. Add 1 Tablespoon of the cooking syrup if using cream cheese. Kaymakli Kuru Kayisi (Cream-Stuffed Apricots) are made with apricots and pistachios, both of which are grown in Turkey. Each July there is an apricot festival in the central region of the country. Soak the apricots in cold water overnight and drain. Heat the sugar and water together over medium heat for 10 minutes, then add apricots. Cook the apricots until they are tender and syrup is formed. Add the lemon juice and remove from heat. With a slotted spoon, transfer apricots to a plate to cool. With a spoon, open the apricots halfway and fill the inside with cream or sweet cheese. Arrange the apricots (slit side up) on a platter, pouring over them as much syrup as they can absorb. Garnish with grated nuts. In a large saucepan, mix the rice, sugar, milk, and vanilla extract together. Bring to a boil on medium to high heat, stirring occasionally. Continue boiling for 1½ to 2 hours, or until a pudding consistency is reached. If not boiled long enough, the rice gains remain too hard. Put in individual cups or shallow serving dishes, cover the top, and chill before serving. To serve, sprinkle with cinnamon. If desired, orange zest, cinnamon, cloves, or rose water can be used instead of, or in addition to, vanilla. 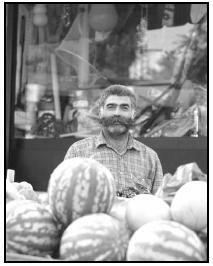 A colorful Turkish fruit vendor poses with his melons. Turkey is one of only seven countries in the world that can produce enough food to feed its people. This advantage gives the Turks access to fresh, locally grown ingredients that help to create some of the freshest dishes available. Contrary to common belief, Turkish cuisine is generally not spicy (though this varies throughout the seven regions). Seasonings and sauces, although frequently used, are simple and light and do not overpower the food's natural taste. The most popular seasonings include dill, mint, parsley, cinnamon, garlic, cumin, and sumac (lemon-flavored red berries of the sumac tree). Yogurt is often used to complement both meat and vegetables dishes. Rice, wheat, and vegetables are the foundation for Turkish cuisine. Dolma , rice- and meat-stuffed vegetables, is frequently prepared throughout the country, most often with peppers, grape leaves, or tomatoes. The eggplant is the country's most beloved vegetable, with zucchini a popular second and then beans, artichokes, cabbage, particularly when prepared in olive oil. Pilav (pilaf), Turkish rice, is a common filling for dolma , as well as a common side dish. Various grains are used to make pide (flat bread), simit (sesame rings), and börek , a flaky, layered pastry filled with meat or cheese that is often eaten for breakfast. Turkish meat usually means lamb, the main ingredient to the country's most popular national dish, kebap (skewered grilled meat). The kebap resembles the familiar shish-kebab (onions, tomatoes, and peppers threaded on a skewer between pieces of meat and grilled) commonly eaten in the United States. Patties of seasoned minced meat called köfte are also popular. Most cattle are raised for their milk rather than for beef, and pork is prohibited in the Islamic religion (which nearly all Turks practice). Poultry and seafood, however, are second in popularity for meat-based meals. Turkish sweets are most frequently eaten with coffee or as a snack, rather than an after-dinner dessert. The most common dessert is a bowl of seasonal fresh fruit, such as strawberries or apricots. Baklava , widely known throughout the Western world, and other nutty pastries consisting of a sweet, flaky pastry made with honey and nuts; Halva (a sesame paste), dondurma (ice cream), and muhallebi (milk-based desserts, such as pudding) are all popular. Some adults prefer tea, strong Turkish coffee, or raki , the clear liquorice-flavored national beverage, in place of dessert. Children enjoy ayran , a refreshing yogurt drink, or meyva suyu (fruit juice). Mix the water, sugar, and cinnamon together in a saucepan and boil for 3 minutes. Remove from heat and let cool. Using about ⅓ of the stick of butter, brown the pine nuts. Add the remaining butter and farina and stir until the farina is a light brown color. Very carefully add the cinnamon syrup to the farina mixture. Stir until most of the water is absorbed and forms a sticky mixture. Remove from the heat and leave uncovered for 1 hour, until it dries to a crumbly consistency. Shape in individual molds or spoon into dishes. Serve at room temperature topped with ground cinnamon and sesame seeds. Squeeze out the excess water from the soaked bread. Place flour in a shallow dish, and roll the meatballs lightly in flour to coat. Heat oil in a shallow frying pan. Carefully add meatballs and fry in hot oil for 6 to 8 minutes, turning frequently, until browned and cooked through. They may be shallow- or deep-fried. Place the flour and salt in a large bowl and make a hole in the middle. Into this hole pour the margarine, olive oil, milk, water, and beaten egg. Stirring from the outside into the middle, gradually mix all the liquids into the flour until you have a dough. It will feel a bit oily. With floured hands, shape the dough into rings about the diameter of a saucer, and arrange them on a baking sheet. Brush them over with milk and sprinkle the sesame seeds on top. Bake them for about 30 minutes, or until they are nicely browned. Turkey celebrates three kinds of celebrations: national religious holidays, national secular (nonreligious) holidays, and local events and festivals. National Islamic holidays are important to the Turks since 99 percent are of the Islamic faith. To celebrate religious events, special dishes for family and friends are frequently prepared. The first significant holiday of the Muslim year, Muharrem, takes place on the tenth day of the first lunar month. On this day in history, the grandson of the Prophet Mohammed was martyred and Noah and his family were able to leave the Ark after the floodwaters receded. A thick, sweet pudding called aure (also called Noah's pudding) is traditionally prepared. Its ingredients (fruits, nuts, and grains) are supposedly the same ones that remained on the Ark after it was able to land. The ninth month marks Ramazan (also known as Ramadan in Arabic countries), a month-long period of fasting in which Muslims refrain from food and drink during daylight hours. Iftar is the meal eaten at the end of each day that breaks the daily fasting period. Seker Bayrami , or translated as Candy Festival or Festival of Sugar, is a three-day national festival marking the end of Ramazan (also known as Eid al-Fitr in Arabic countries). On this day, elaborate desserts are prepared throughout the country and children visit door to door, asking for sweets. On this special day, lokma (deep-fried batter in syrup) and locum (a popular Turkish candy, also known as Turkish Delight), are commonly distributed to neighborhood children in small tins. Sprinkle gelatin into ½ cup water and set aside to soften for about 5 minutes. Pour another ½ cup water into a medium-size saucepan, bringing to a boil over medium to high heat. Add the sugar and corn syrup, stirring until the sugar dissolves, about 1 minute. Continue cooking until mixture reaches 240°F on a candy thermometer, or until it forms a soft ball when ½ teaspoon of mixture is dropped into a cup of cold water. Dissolve cornstarch in remaining ½ cup water and mix well. Add to sugar mixture, and stirring constantly, simmer slowly until very thick, about 3 minutes; remove from heat. Add lemon juice and gelatin mixture, stirring until gelatin dissolves. Add nuts and stir thoroughly. Line bottom and side of 8-inch cake pan with foil and sprinkle with thick layer of powdered sugar. Pour in candy. Allow to stand, undisturbed, for about 4 hours, or until firm. Cut into 1-inch squares, and roll each piece in powdered sugar to coat all sides. 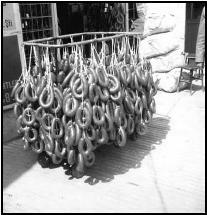 Rings of sucuk (spicy sausage) hang outside the butcher shop. Sucuk may be part of a dinner menu all year round. Large feasts are also prepared for national secular holidays such as Independence day and Children's Day, both on April 23, New Year's Day on January 1, and Victory Day on August 30, marking independence from Greece in 1922. In addition, June's Strawberry Festival in Bartin, July's Apricot Festival in Malatya (Turkey's apricot capital), and September's Watermelon Festival in Diyarbakir draw large, local crowds who gather to honor these crops. Make the syrup by simmering the 1½ cups sugar and 2 cups water for 5 minutes. Stir in the lemon juice, bring to a boil, and set aside. To make the dough, dissolve the yeast in the warm water with a pinch of sugar, and leave in a warm place for 10 minutes until frothy. Put the flour in a large bowl, make a well in the center, and put in the butter, salt, and yeast mixture. Heat the oil for deep-frying (a small square of bread should brown in 30 seconds). Keeping the heat at medium, drop small balls of dough into the hot oil. Drop 5 or 6 lokma into the oil, depending on the size of the pan, but do not crowd them. They should immediately rise to the surface and puff up. Stir them to ensure an even browning. They should brown in 3 or 4 minutes. Drain on paper towels, then dip them briefly into the syrup mixture. Turks enjoy three meals a day. Kahvalti (kah-vall-tuh), or breakfast, is generally a light meal consisting of fresh tomatoes, beyaz (salty cheese), black olives, bread with jam and honey, and an occasional soft-boiled egg. Freshly baked bread and tea are almost always present. Sucuk (a spicy sausage) and pastirma (seasoned beef) are frequently prepared in the wintertime. Those in a hurry often stop at a street cart or büfe (food stand) to grab a quick börek , a flaky, mince- or cheese-filled pastry or simit , a bread ring topped with sesame seeds. Muslims almost never consume pork products, making bacon absent from most menus. Öyle yemek (oy-leh yem-eck), or lunch, is traditionally a heartier (and warmer) meal than breakfast. Çorbalar, or soups, are served in a variety of ways, most commonly including lentils and various vegetables and meats. Larger lunch items include baked lamb or chicken served with peppers and eggplant, and fresh grilled fish with a side of lemon. Rice and bulgar pilaf dishes are also popular. Lahmacun (lah-mah-jun), Turkish pizza, is popular among children. It consists of a thin crust and a layer of spicy ground lamb and tomato sauce. Tost, a grilled cheese sandwich, will please even the pickiest eater. Akam yemek (ak-sham yem-eck), or dinner, is the largest meal of the day. Mezeler (or mezze , singular), are "appetizers" served before the main meal. Ironically, most mezeler dishes are large enough to comprise an entire meal by themselves. Salads, soups, pilaf-stuffed fish, and köfte (fried minced meatballs) can leave diners quite full. A meat dish accompanied by starchy vegetables (such as potatoes) typically follows. Seasonal fresh fruits or milky puddings are most often enjoyed for dessert. Turks, who are extremely hospitable and enjoy company, will welcome even unexpected guests with Turkish coffee. Meals are traditionally served on a large tray, placed on a low table or on the floor. The family and guests sit on cushions on the floor around the prepared foods. To avoid accidentally insulting the host, it is best to not refuse second or third helpings. It is also customary to remove one's shoes at the door and offer a small gift to the host for their generosity. Restaurants, open markets, and büfe (food stands) offer a wide variety of on-thego snacks, including simit, köfte, seeds and nuts, and seasonal fruit and fruit juice. Patates Firin (baked potato carts) can be found for kumpir (potatoes) topped with lentils, butter, cheese, pickles, and mayonnaise. Peel and quarter onions with the tomatoes in a food processor or blender and process (blend) until smooth. Add the salt, black pepper, and meat, and ground for 30 seconds more. With a spoon, spread the mixture over the pitas. Place them in the oven and bake for 20 to 30 minutes. Make certain meat is fully cooked (not pink inside). Serve hot. Makes 6 to 8 pizzas, serving 12 to 16. About 2 percent of the population of Turkey are classified as undernourished by the World Bank. This means they do not receive adequate nutrition in their diet. Of children under the age of five, about 10 percent are underweight, and over one-fifth are stunted (short for their age). Crops such as wheat, barley, sugar beets, grapes, maize (corn), sunflower seeds, hazelnuts, and oranges are grown on 90% of Turkey's arable land. Crops are sensitive, however, to variations in rainfall and output is often unpredictable. Some years enough is produced for export, while at other times limited rainfall may only produce enough grain to feed the Turkish population. Despite such uncertainty, Turkey is one of the few countries in the world that produces enough food to feed its people. In addition, the adoption of modern machinery has allowed more land to be used for cultivation, helping to increase food production. Ayliffe, Rosie, Marc Dubin, and John Gawthrop. Turkey: The Rough Guide, 3rd edition . London: Rough Guides Ltd., 1997. Facaros, Dana and Michael Pauls. Cadogan Guides: Turkey . Guilford, CT: The Globe Pequot Press, 2000. Let's Go Publications. Let's Go Turkey . New York: St. Martin's Press, 2001. Peck, Adam and Manja Sachet. Turkey Guide . Cold Spring Harbor, NY: Open Road Publishing, 1999. Robertson, Carol and David. Turkish Cooking: A Culinary Journey through Turkey . Berkeley, CA: Frog, Ltd., 1996. Salaman, R. The Cooking of Greece and Turkey . Cambridge, England: Martin Books, 1991. Beltur. [Online] Available http://www.beltur.com.tr/ing/yemek.htm (accessed March 8, 2001). Cankan Real Estate Agency. [Online] Available http://www.cankan.com/izmir/200tcuisine.htm/ (accessed March 8, 2001). Cypriot-Turkish Cuisine. [Online] Available http://www.cypnet.com/.ncyprus/cypcuisine/ (accessed March 26, 2001). 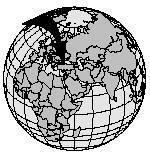 GlobalGourmet.com. [Online] Available http://www.globalgourmet.com/destinations/turkey/ (accessed March 21, 2001). Istanbul Homepages. [Online] Available http://www.guideistanbul.net/ (accessed March 8, 2001). Mersina. [Online] Available http://www.mersina.com/food_and_drink/turkish_delights/turkish.htm (accessed March 8, 2001). Ministry of Tourism, Republic of Turkey. [Online] Available http://www.turizm.gov.ru/cu2.html (accessed March 22, 2001). Sallysplace.com. [Online] Available http://www.sallys-place.com/ (accessed March 2, 2001). Story of Turkish Food. [Online] Available http://www.public.asu.edu/~okenes/tr_ye_01.htm (accessed March 2, 2001). Toto Hostel and Guest House. [Online] Available http://www.totohostel.com/foods-entertainment.htm/ (accessed March 8, 2001). Turkish Cuisine. [Online] Available http://www.fspronet.com/sheilah/turkish.html (accessed March 21, 2001). Turkish Cultural Foundation. 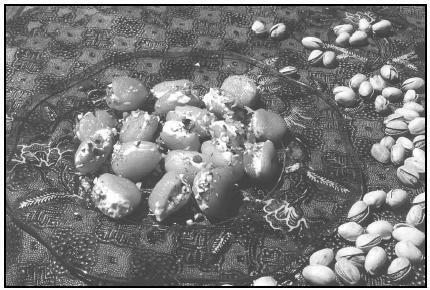 [Online] Available http://www.turkishculture.org/culinary_arts/food.html (accessed March 21, 2001). This article is very good. I was wondering who wrote the article, & if they were turkish, or just visited Turkey & wrote the article?